Hello there friends! Today I am beyond excited about the story that will be shared. Last weekend, I had the opportunity to attend my friend Shala's wedding in Texas, where I met a lovely girl by the name of Jess, who was Shala's maid of honor. Jess was so sweet, and absolutely gorgeous. But beyond all of that, there was something different about her. She had a certain kind of strength that was undeniable. I couldn't put my finger on it, but there was something incredibly unique there. You could just feel the presence of God amidst her. When Jess prayed over Shala before the ceremony, it was honestly one of the most powerful prayers I have ever heard. I remember thinking to myself: "Dang, this girl is on fire for Jesus!" 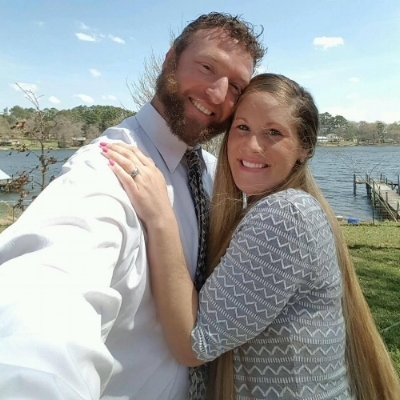 After connecting with Jess at the wedding, I learned that recently she had experienced a heartbreaking tragedy: her husband Cody had sadly passed away back in January of 2017 from an unexpected fishing accident, leaving her alone with their daughter Abby. Even though a lot of people in this situation would become bitter and choose not to trust God, Jess is choosing the opposite. She is choosing to trust God in the storm. Something awesome about all of this too is that Jess is a published writer and part of her story has already been published in a book. Jess hopes to write a book of her own one day. And now, here is Jess's post: prepare to be encouraged beyond words! Here is Jessica's post, "An Eternal Romance:"
If you follow me on Facebook, you may have noticed more recent posts referring to missing being romanced by my husband. I have had to really take this to the Lord. I have had to lay these feelings at the foot of the Cross. Of course after the death of one’s spouse, or even a breakup or divorce—you’re most likely going to miss the romantic sparks. The sweet surprises, love notes, flowers, the whispering's of “I Love you”… whatever it is that defined romantic gestures in your relationship. I know it’s normal. I know this is a part of grief I have to walk through. But I also know my personality. I know if I dwell on this part of my life being lost along with my husband it can create a dark pool of self-pity. It can create a selfish monster who says, “I deserve that in my life”. That selfish monster would not make wise decisions. I don’t have time to not be wise. Neither do you. Can I get an Amen? Let’s take a moment and really think about our society—All of these dating apps, dozens and dozens of Reality shows designed for finding love, The Bachelor, The Bachelorette, Blind Date, Married at First Site, Love Connection, Bachelor in Paradise… The list can go on and on. There is nothing wrong with yearning for love, and seeking love, or watching people go out on a limb to find it—I admit I watch a few of these shows myself. They can be quite entertaining. And yes, some really do find love at the end of the show. But what if these individuals focused more on an eternal romance rather than an earthly one? I bet their perspective and satisfactory levels in life would sky rocket. Through my current stage of grief I can feel the Lord prompting me to dissect my own heart. My relationship with him is designed to fulfill ALL my emptiness and longings. “Lord be enough for me,” I pray daily. Psalm 107:9 says, “For he satisfies the longing soul, and the hungry soul he fills with good things.” Those aren’t just nice words strung together to make a pretty sentence. It is TRUTH. Jesus wants every area of our heart and soul. He wants to be the One who fills us. All other fillings will fade away. Even the great loves of our earthly life. People will let us down and disappoint us. We will let people down and disappoint them. Death parts earthly love. Death will never ever part the eternal love of Jesus. We live in such a dissatisfied culture and generation. We seem to always be striving for more. And then when we obtain that ‘more’. Guess, what? We want even more. Singles seem to be in a downward depression because they want to be married. Married folks aren’t appreciating their spouses and wish they were single. It’s a never-ending battle of unsatisfactory circumstances from our fleshly perspective. Here is some earth-shattering, life changing news—We have the answer to a more than satisfactory life. His name is Jesus. And He literally saves souls. He wants to romance you to depths that your human mind cannot imagine. He wants to have an intimate relationship with you. Not a religious one, an intimate one. This is the place I am at in my walk with the Lord. I have walked with Him since I was a child. But there is something about this season of grief that has opened my eyes to new realms of who God really is. During my marriage I faced seasons of loneliness, and disappointment—as did my husband. I was a difficult person to be married to, especially in our first year. Nothing satisfied me. I wished I knew then what I know now. The more you allow the Lord to work in you, the more you want to LOVE others with a passion. Even when life seems to be turned upside down, we can react in love because of the love of Christ living inside us. When I get stuck in my selfish, fleshly mind, I begin to fear my future. I begin to pity my title of widow, and my daughter’s title of fatherless. I become angry. I am overcome with deep sorrow. I yearn for my husband’s strong arms around me in the middle of a long grief filled sleepless night. But the Lord is drawing my heart to Him in a way that would never be without facing this dreaded earthly pain. He is bringing my heart, mind and spirit to focus eternally. It’s not about what I can see in front of me. It is about the unseen, for the unseen things are the eternal things. He is bringing me to an Eternal Romance with Him. It is ironic how such dark, bleak, tragedy can change you to the core for the better. Christ uses life altering phenomenon’s to draw us nearer to Him when we are at our lowest points. If we surrender through the pain and darkness, He will lift us up. He will set our feet on the rock of His foundation, on His steadfast love. In the first weeks following my husband’s death—all I could do spiritually was cry out “I Trust my God, I Trust my God, I Trust my God.” I had no other words to pray. Every great love story begins with trust. It’s no different with the love story of our Savior. I know my heart being drawn to the eternal romance of Christ began when I surrendered. When I put all of my trust into Him. Not some of my trust—but all of it. (I have to do this daily) I had a revelation that my life is not my own. Our earthly lives are but a blink of an eye— however our eternal lives are just that… eternal. Forever, and then forevermore. Realistically, I am young—one day, Lord willing, I hope to be re-married. But my focus is not on an earthly love. My desires, my heart, my yearnings are on an eternal love. An Eternal Romance with my Savior. Everything else falls into place after that. “For this light momentary affliction is preparing for us an eternal weight of glory beyond all comparison, as we look not to the things that are seen but to the things that are unseen. For things that are seen are transient, but the things that are unseen are eternal.” 2 Corinthians 4:17-18. “You make known to me the path of life; in your presence there is fullness of joy; at your right hand are pleasures forevermore.” Psalm 16:11. I Trust my God, I Trust my God, I Trust my God.